The first thing I noticed about Roast was the lamb roasting on a spit and the giant open kitchen filled with attractive guys cooking up a storm. I felt like pulling up a bar stool and just watching the action in the kitchen. Once the food started coming our way, I tore myself away from the 'cooking show' and turned to the amazing smells and tastes coming our way. Roast is Chef Michael Symon's joint in Detroit and was just as amazing as his hometown restaurants that I've visited - Lola and B Spot. There are a couple of cross over items, including the amazing Beef Cheek Pierogie (which I had at Lola earlier this year) which marries rich shredded beef, pastry-like pierogie, red wine infused mushrooms and a dollop of zingy horseradish. Our server was fantastic and knowledgeable about the menu. When I asked which dishes were locally sourced, she steered me to the Mixed Greens Salad from Greg Willerer's Urban Farm (locavores - click that Willerer link & learn more about him) and the Braised Beef Short Ribs from Gunthorp Farms in Indiana. 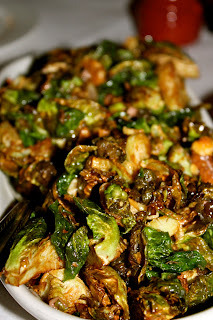 My favorite item ended up being the side serving of Fried Brussels Sprouts. I'm not quite sure how I've gone from eschewing sprouts a year ago, to LOVING them today (when prepared correctly.) Even better, I scored how they are prepared and list the steps after the jump. Visit Roast at the Westin Book Cadillac Hotel, follow Michael Symon on Twitter or "like" him on Facebook. I hear rumors Chef Symon is shopping for a DC location... and I'm wondering how fast he can get here.